I wanted to get up early Wednesday morning to see the Lyrids Meteor Shower in the wee hours just before sunrise, as well as possibly photographing the Waning Crescent Moon as it cuddled up with Venus. This image was one of the keepers from this early morning shoot. 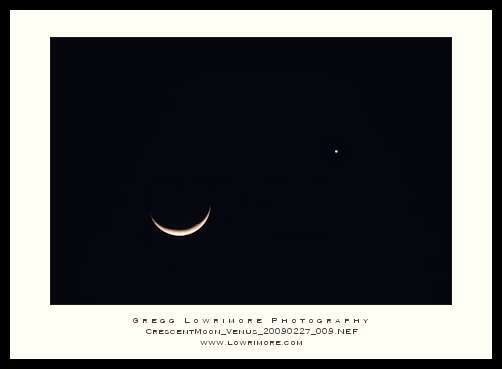 Simple composition, good colors, and highly visible Venus and Moon! Enjoy. 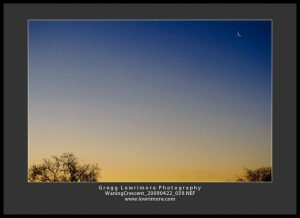 Posted in Landscapes, Shoots and tagged spring, sunrise, venus, waning crescent moon by greggl with no comments yet. I tried capturing the Crescent Moon and Venus convergence last evening. What a beautiful site though. I read somewhere, perhaps on Space Weather that 1/320th at f/5.6 and 400 ISO would be a good starting point for the exposure settings, but I didn’t like what I was seeing in the LCD using those settings, so I had to open things up a bit to get the right exposure for my location and timeframe and sunset. Posted in General and tagged crescent, moon, sunset, venus by greggl with no comments yet.